This super easy spaghetti puttanesca recipe from Rachel Phipps is perfect for a speedy midweek meal. 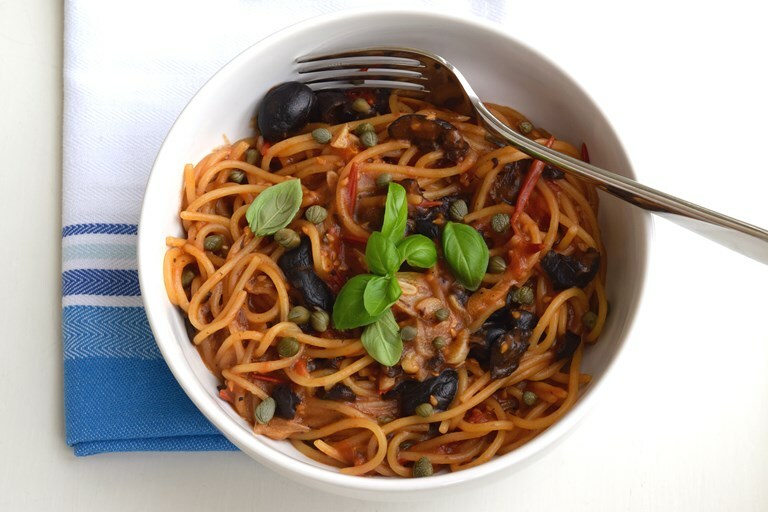 Simple to make, this one-pot pasta dish does exactly what it says on the tin – spaghetti, tomatoes, black olives, basil and capers cooked in one saucepan on the hob combine to provide an almost instant Italian feast for one. This is the pasta dish to make when you’ve just got home from work and you want to have dinner on the table as quickly (and with as little effort) as possible. 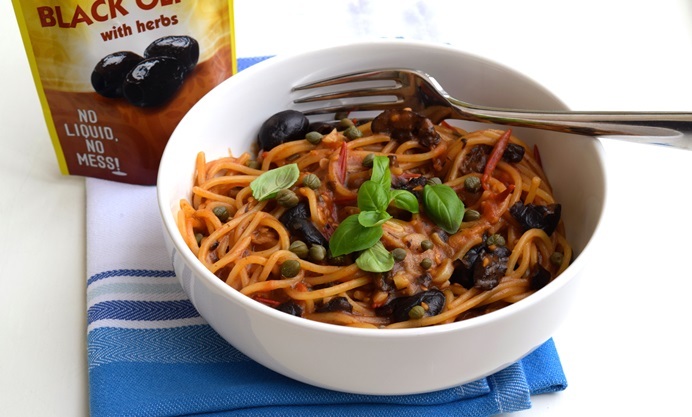 No, it does not have a same fresh, bright hit as a classic puttanesca, but the rich, starchy sauce, flavour from the anchovies and piquancy from the black olives and non-pareille capers, make this an altogether more comforting bowlful – perfect for those days when you’re craving a sunny bowl of pasta but it is pouring with rain outside. Using this one-pot method you can pretty much use the same ingredients you would in a classic puttanesca, with a few slight alterations. The use of fresh cherry tomatoes rather than tinned lightens the sauce a bit, and using dried olives that have not been stored in brine make sure the dish does not get too salty. They also plump up beautifully with the cooking liquid.